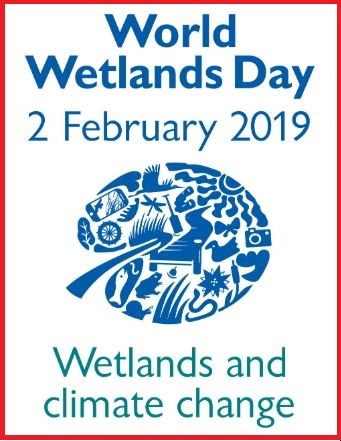 The World Wetland Day (WWD) is observed every year on 2 February around the world to raise awareness about the value of wetlands for humanity and the planet. The World Wetland Day day marks the date of the adoption of the Convention on Wetlands (also called as Ramsar Convention) in 1971 in the Iranian city of Ramsar on the shores of the Caspian Sea. The World Wetland Day theme for the year 2019 is “ Wetlands and Climate Change.“. The theme underlines the importance of wetlands and climate change that is rapidly taking place. The World Wetland Day was first celebrated in the year 1997. Since then it is observed every year to spread awareness about the Ramsar Convention in particular for the conservation of Wetlands. Wetlands are transitional lands between terrestrial and aquatic ecosystems where the water table is usually at or near the surface or land is covered by shallow water. It may be manmade or artificial. They support rich biodiversity and provide a wide range of ecosystem services such as water storage, aquifer recharge, water purification, flood mitigation, erosion control, act as carbon sinks and others. Ramsar Convention aims to raise public awareness on conservation, proper utilisation, and management of wetlands and their resources. It also seeks to promote the conservation and wise use of all wetlands through local, regional and national actions and international cooperation, as a contribution towards achieving sustainable development throughout the world.